Heavenly blog! : No. 1663: Following the dark and demonic assault on me and the heavenly blog, the public support we have received most of the Human Rights Association and today's editor Vebjørn Selbekk, pointing out that there are religious expressions! No. 1663: Following the dark and demonic assault on me and the heavenly blog, the public support we have received most of the Human Rights Association and today's editor Vebjørn Selbekk, pointing out that there are religious expressions! No. 1663:Following the dark and demonic assault on me and the heavenly blog, the public support we have received most of the Human Rights Association and today's editor Vebjørn Selbekk, pointing out that there are religious expressions! Jan Aage Torp runs two sets of laws, he himself can violate all. But if he is violated by someone else, it is obviously punishable. He has in the worst possible way after his children's statements violated them in the worst imaginable way of expelling demons from those whom he obviously has been taken of. When others point out that he is the problem, not anyone else.Then he feels angry and does the same as Judas Iscariot, goes to the authority to seek support and "goodwill"!Clearly, Satan and his demons are obviously the reason. We read about Judas Iscariot following.Joh.e. 13. 27 And after he had received the play, Satan entered into him. Jesus then says to him: What you do, it will do soon!Judas delivered Jesus to the authority after Satan for into him.Jan Aage Torp handed me to the authority after Satan for entering him.Judas made it for wretched 30 silver coins. 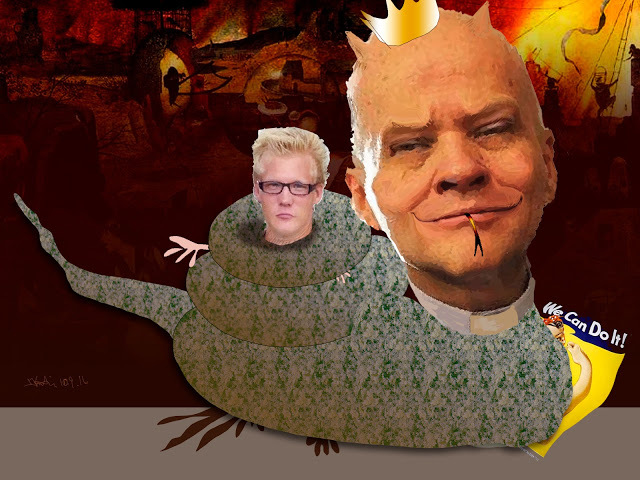 Jan Aage Torp did it to stop me and the heavenly blog for his hatred that the heavenly blog and our english blog were so popular and proclaimed against his horror that Torp was guilty of his marrying and had no reason for the word of god to marry say againDo not write such a long article this time as I usually do. But brings an article in from the Resett web page that writes very well about this topic.Who really has the right to be violated?The first thing to think of when you think someone has acted offensive about something is who wants to set the tone for what is acceptable or not.Is it yourself?If you answer yes to that question, how active are you in letting yourself be offended? Those who insist on climbing the ladder to peek into the neighbor's bedroom and then feel offended by what he saw there can not possibly invoke the right to be violated.In section 390a of the Criminal Code, it is described by the person who, by means of intimidating or disturbing behavior or other reckless conduct, violates another's peace. To "violate another's peace" means striking the integrity of the mind. The provision only affects mental impairment. The sentence is a fine or imprisonment for up to two years.In other words, it will be someone else who violates you, not something you actively seek for yourself.Let's take the example of Liv Signe Navarsete and the SMS message she received. She experienced it as offensive. Then she had two choices. She could tell about this publicly and thus launch a solid bridal ball, something she chose to do.But she could also have chosen not to go public with her reaction, nor thought that this was a scary message that she did not like, but then let it all lie. However, she chooses to pick this up public again two years after receiving this text message. What does Navarsete say?To say that you feel insulted by something as if it gives you a right to respect, meaning and understanding when all you really do is just suture does not give you any impression of being a person with integrity and well-developed rhetoric .It is not written anywhere that you necessarily have to go out and tell the whole world about how insulted you were. We all feel we are offended by various events or statements that we experience in our daily lives, but it is not always necessary to shout out to the whole world about it.It may seem that this violation act has been misunderstood or even abused in today's society. The development is scary, as it all ends up with an attack on freedom of expression rather than privacy.If you get offended by something and it feels natural for you to use the law to prevent this from being expressed, think about this:If I get emotionally upset by the oppositions of others, will it give me a right to prevent them from expressing their thoughts and opinions?If you answer that question, you are not the best friend of speech and I feel offended by your answer.And what then?